The newly developed PDW-HR1 XDCAM HD422 Field Station further enhances the operational capability of this series. The PDW-HR1 packs a large number of functions into its compact yet robust body. With a large 9-inch* WVGA LCD, material can be checked on the spot and a wide variety of GUIs offers superb operational efficiency. 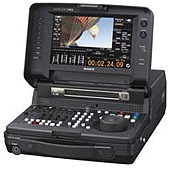 It provides multi-format recording capability as standard, including a frame rate of 23.98P in 1080 mode and SD recording. A wide range of signal interfaces, including baseband video (composite, HD/SD-SDI), Gigabit Ethernet, MPEG TS**, DVB-ASI**, and HDMI are also provided. What's more, an FTP client capability*** allows the PDW-HR1 to transfer files via its Ethernet connection without the need for a PC. With its great operational versatility, the PDW-HR1 further expands the operational applications of the XDCAM HD422 Series. * Viewable area measured diagonally. ** Requires optional PDBK-202 board. *Optional PDBK-202 is required for HDV IN/OUT.